Kvernufoss is a less known 100 foot tall waterfall near Skogafoss, in south Iceland. 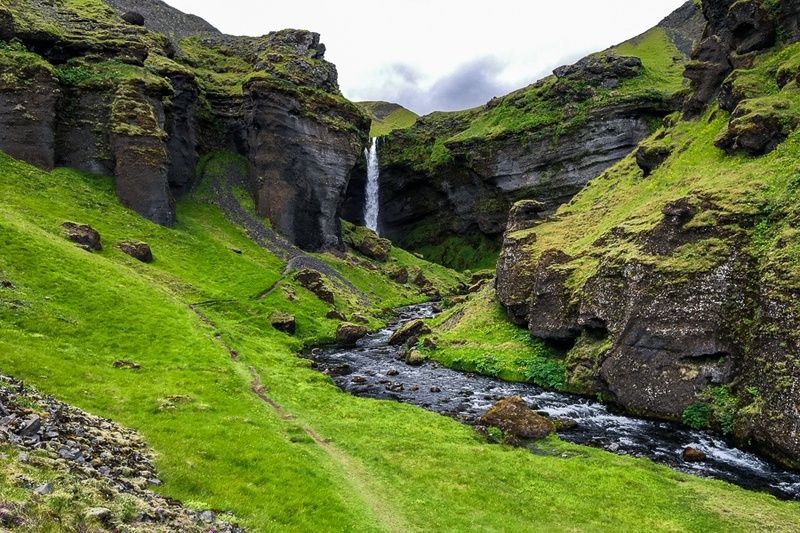 The 20 minute hike from Skogar to Kvernufoss is a scenic walking path through an incredible green canyon that looks like something out of Lord of the Rings. The hike to the falls is worth it just for the surroundings alone! I thought I was going to see trolls. Kvernufoss is another waterfall you can walk behind for a different perspective, but waterproof clothes will be handy if you want to go take pictures near the waterfall. Watch your step too, because the rocks can be really slippery. Go south along the Ring Road (Route 1) until you reach the Skogar Museum. From the museum parking lot, it’s a short 15-20 minute hike to the waterfall. Kvernufoss is about 90 miles (150 km) from Reykjavik, so it can easily be done as a day trip, along with Skogafoss and some other nearby attractions. No entry fee is required to visit Kvernufoss. The nearby Skogar Museum has some Icelandic turf houses and other neat things that are also worth checking out while you’re here.